Check 2 more things off the list of Minnesotan things to do for Team Cross. 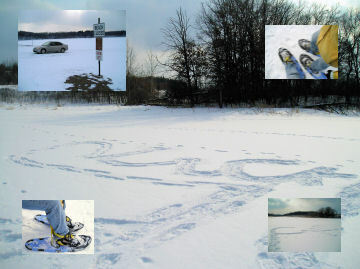 This weekend we went snowshoeing and drove our car on a lake. We went to the Hyland Park Preserve to learn about Maple Syruping, but since it was a ton of little kiddos we decided to slip out and rent some snowshoes. We took them out for about an hour and a half and explored some trails and lakes! Below is a picture from the adventure. We spelled our names on the middle of a lake and had a good time. We also decided to give driving on a lake a whirl - there was a small lake nearby the park with 5 -6 other cars and trucks on it so we figured it was a safe bet, despite the "thin ice" sign. The below picture was taken afterwards with the car safely on the beach. It is a very weird feeling to be driving on a lake! Snowshoeing would rule...i've got to try that sometime!